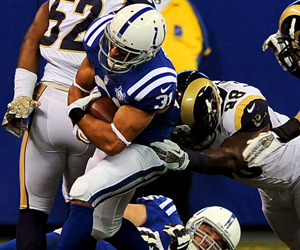 This week’s “Back-Up of the Game” presented by Venyu is running back Donald Brown. As he has done for nearly the entire season, Brown continued to be a productive piece of the Colts offense. On Sunday, it came in the receiving department as Brown caught a career-high five receptions and his 64 receiving yards were the second highest of his career. Brown’s 13-yard touchdown reception was his first touchdown catch in the NFL and after the game, the veteran running back did not want to chat much about his individual effort. “They came out to play and they outplayed us. There’s no other way around it,” Brown said of the 38-8 loss. With Reggie Wayne out of the season, Brown is the most experienced member of the Colts skill position players and he talked about the big picture after the loss. “We knew going into the game that we have to be able to run the ball. We didn’t do that and we didn’t take care of the ball. We will correct those errors,” Brown said. Forgot about being a short week, if we get punk again this week the Colt’s players should have more to worry about than who their next opponent would be; How about who’s your next employer would be? The only saving grace is that it happens in regular season game; where you can learn from your mistakes and make corrections… so far the trend has been, fall behind early, open your bibles and pray for forgiveness.